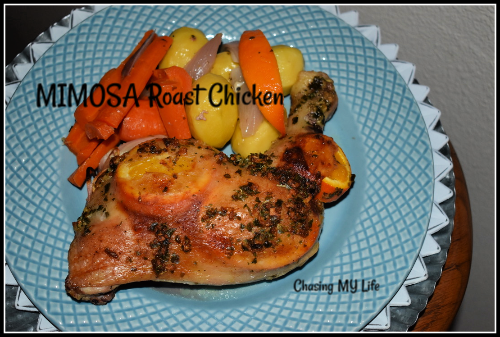 The original recipe from Taste of Home called for a whole roasting chicken, but I’ve adapted it a more user friendly way of not only roasting, but also serving and eating. This chicken becomes a rich, buttery and juicy bite that is only complemented by each bite of fluffy mashed potatoes and fragrant champagne gravy. Arrange carrot pieces in a single layer on bottom of roaster to form your “rack”. Cut one orange into slices. Cut second orange into wedges. Combine the melted butter, garlic, onion powder, thyme, basil and red jalapeno. Set side to allow the freeze dried herbs time to reconstitute. Gently use your fingers to loosen the skin of the chicken. Place orange slices under the skin. Generously sprinkle the chicken with FRESH ground salt and pepper. 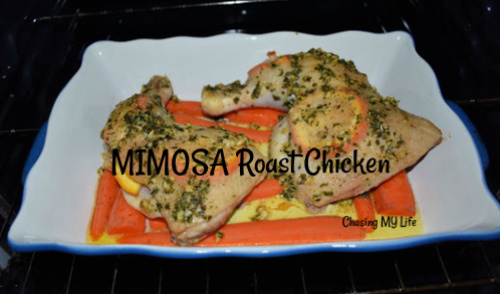 Rub melted butter mixture over skin of chicken pieces and place on top of carrots. Combine Moscato and orange juice. Toss with orange wedges, onion wedges and potatoes. 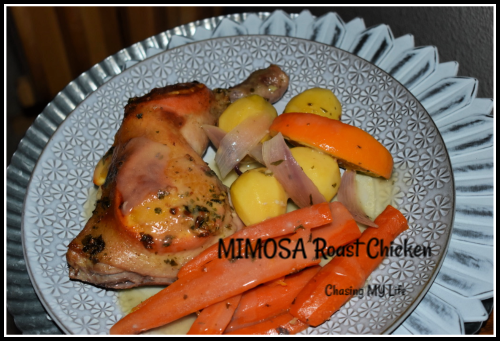 Pour into roaster around chicken. Return to oven for 45 minutes more or until thermometer reads 175°. **(see note) Baste occasionally with pan juices. Cover and let stand 10 minutes before serving. Pour pan juices and loosened browned bits into a measuring cut. Skim off fat, reserving 1 tablespoon. Add enough chicken broth to measure 1 cup. In a small sauce pan melt butter and reserved 1 tablespoon fat. Whisk in flour and until smooth and golden. Gradually whisk in broth mixture. Bring to a GENTLE boil, reduce heat and cook 2-3 minutes until thickened to desired consistency.